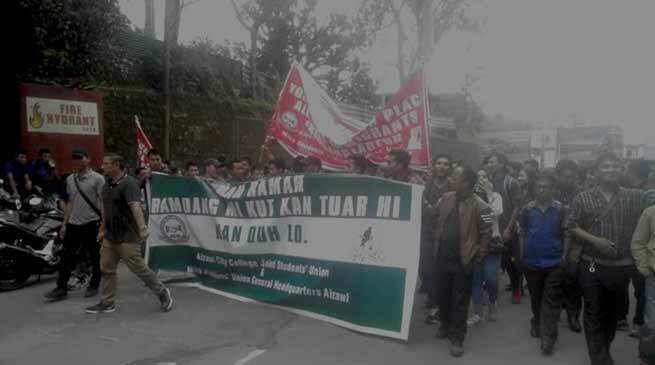 The Mizo Students Union (MSU) and the Aizawl City College Joint Students Union (ACCJSU) has orgnaised a rally here on Friday demanding that the state government detect and deport all Chakma foreigners who illegally migrated to Mizoram from Bangladesh. They also urged the state government to arrest those Chakmas indulged in “violent activities” against Mizo student leaders at Chawngte town in southern Mizoram’ Lawngtlai district recently. The rally demanded that the Chakma Autonomous District Council (CADC) should pay compensation to 20 MSU leaders who were injured in an attack by Chakmas.